This workshop is an advanced Surfacing intensive. The course curriculum is flexible, and can cover any of the more advanced techniques and workflow for surface modeling. Top-down surfacing, with respect to co-injected plastics, Surface Edit in Creo style, Creo Aircraft Surfacing, freestyle Sub’d surfacing or all the new Creo surfacing additions. Most commonly, this course covers all of the Design-Engine Creo Surfacing classes that are not covered in the typical Design Engine Week One surfacing class. Creo Surfacing Level 5 Creating Parametric Surfaces from IGES geoetry, Creo Surface Edit in Style Level 8, Creo Subdivisional modeling Level 10 and Creo Import Data Doctor Level 11. This course also goes deep into managing co-injected plastic and equation, trajpar & evalgraph functions for driving cross sectional area. We also reserve a portion of classroom time for individual projects if necessary. Usually there are less than two or three people in this workshop so instructor/student ratio is ideal. This class can be customized to include any of our workshops. 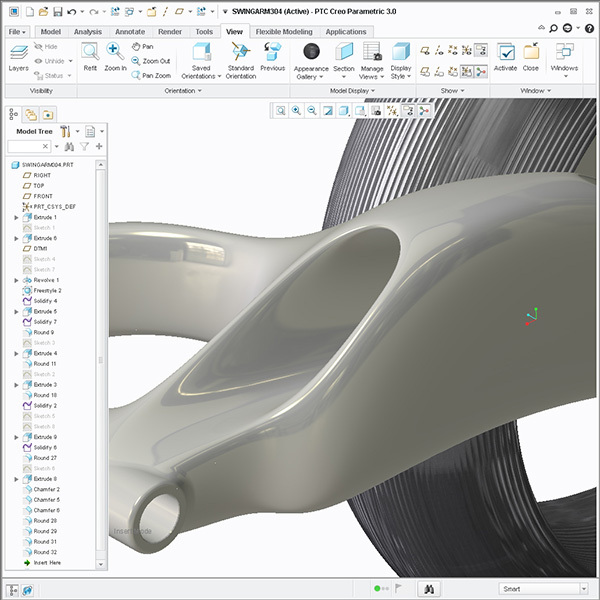 Participants in this course must have taken the Design Engine Creo Surfacing: Week One and have used surfaces for at least one year after completing that course. This workshop is an intense one-week course. This class is imperative for product designers who are pushing the new Creo surfacing tools, and product designers who lead the design teams of major manufactures. This course is usually customized to focus on the participant’s learning wishes (last day) and company-specific projects. Bring example work or problematic models on flash drives for in-context discussions for work during and/or on the last day of class. We supplement this training with Alias Auto Studio style techniques utilized in the automotive industry so some comparisons will be made in this class. Compare approximate composite analysis tools for discussion on the difference between A-Class surfacing and G2 continuity all with respect to light reflections. Creo 3 & Creo 4.0 update 1 hr. Quick review of robust surfacing techniques. Use Copy and Copy Paste Special with an Industrial Design iteration perspective. Manage geometry that will not shell. 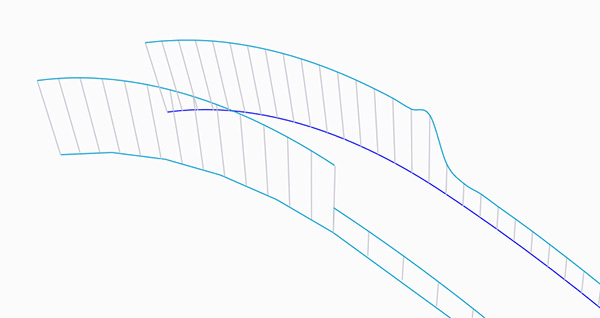 Use layers to manage offset surfaces in the solidification effort for shelling surface contours that will not offset.. Discuss creating offset surfaces for shelling techniques. Approximate composite vs building in 5 or 7 degree curves. Learn to use analysis tools at the highest level. 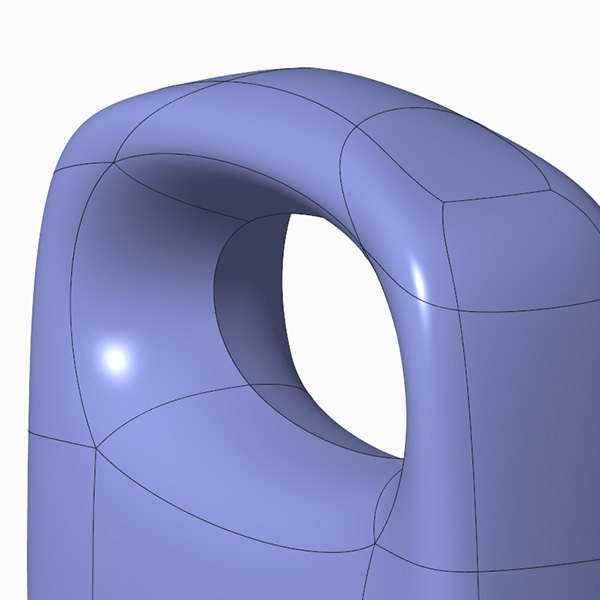 Learn to manage connectivity constraints including Positional, Tangency, and Curvature Constraints between surfaces and curves. 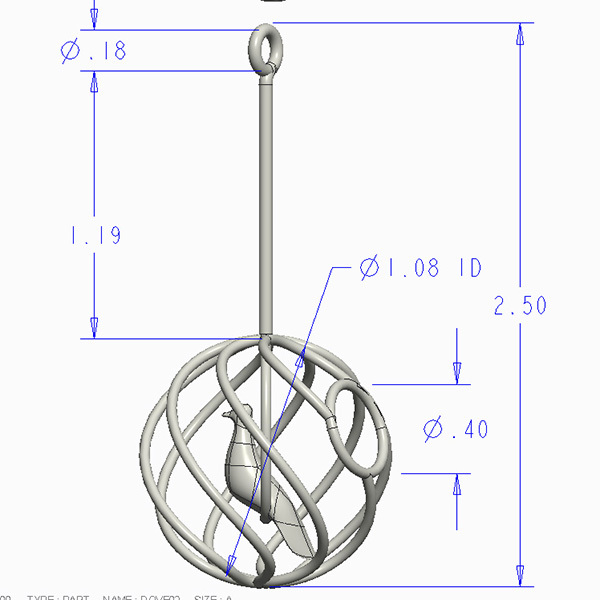 Learn what Knots or ISO Parametric Lines are and gain more control while editing surfaces. Discover workflow solutions and problem solving techniques with Creo and ISDX style esp related to Curvature Continuity. 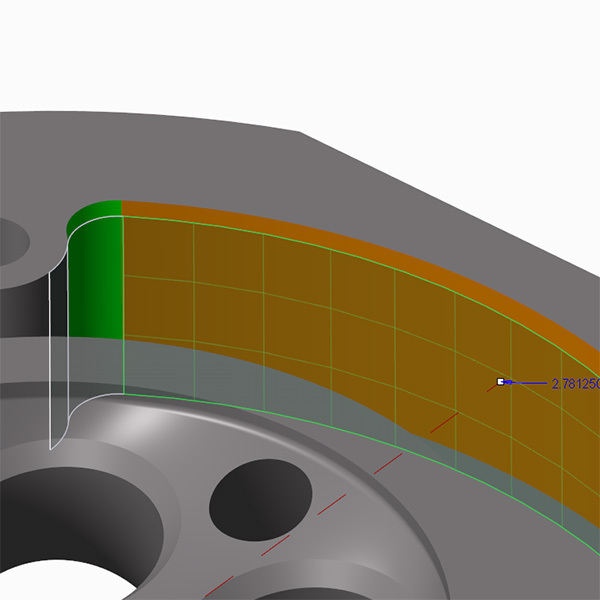 Discuss approaching G3 continuity in Creo 3.0. Discuss the difference between A-Class surfacing and G2 Continuity. 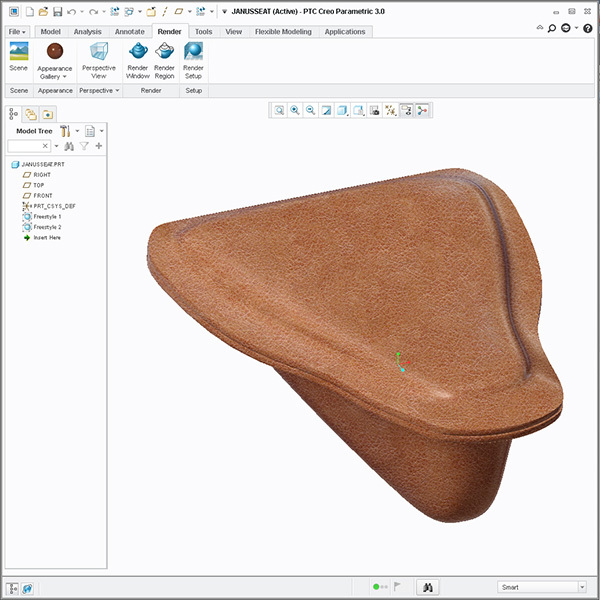 Compare and contrast Alias Studio Surfacing tools to Creo Surfacing tools. Reattach surfaces using Surface Edit tools. Review Control Vertices point manipulations. Learn to use Surface Edit inside Style tool to make subtle tweaks to geometry with several tractor and Motorcycle seats. Learn all the functions of Surface Edit on creating a bionic finger. Compare workflow of ‘Surface Edit’ and CV manipulation of a surface in Alias Studio. Make a Face using Surface Edit. Modifying Lead in for seating. Learn to Mix and match Freestyle with Creo Parametric surfaces. Import Data Doctor Topics – Basic work flow, scope, and purpose of IDD – IDD stands for Import Data Doctor (Design-engine offers a two day class in Import Data Doctor) We suggest this 5 or 6 hr IDD workshop with this second week long surfacing intensive. Discuss basics of import parts then parts into assemblies. Learn to determine where the import came from (header info). Learn to manipulate import points or surfaces. Learn to create facet data from points. Learn to rebuild a set of surfaces geometries on top of faceted or triangulated data. Review in-depth advanced import functions. Learn to manage various import geometries. Discuss in detail problems with import geometry and offer solutions. Go over in great detail redefining functions for import geometry. Learn to rebuild import geometry completely with full robust parametric controls. Discuss detach and reattach techniques. New workflow for Zip Gaps. Learn to delete and rebuild Boundary Blends inside IDD. Merge workflow changed inside IDD and how to do so. Dealing with more simple imports and task based repair of IGES or STEP geometry using IDD. Define Gaps, Repair Gaps, and Closing gaps. Gaps/Slivers and how to manage them. Modify, Extrapolate, Align, Transform, and Replace. Freezing entities vs managing what changes during manipulations. Learn to manage sheet metal imports, Convert, Combine, and Extrude (convert non-parametric data to parametric features). Discuss reverse engineering history and evolution. Discuss workflow techniques for rebuilding robust parametric models from import geometry. Discuss alternate techniques to getting scan data for capturing form. Discuss inspection techniques to compare one parametric model to existing scan data. Creating parametric curves and surfaces on top of static import geometry. Discuss using import geometry for checking assembly interference. Discuss building parametric curve and surface geometry directly or indirectly from IGES or STEP geometry. Discuss techniques for moving import data into the appropriate position for managing the model construction process. Discuss granite one seamless imports. Discuss import techniques for rebuilding ergonomic forms. Share manipulation techniques with respect to Edit Plane and discuss workflow related to making changes quickly. Discuss various types of data for import such as Points, Facet Data, DXF, Step and IGES. User Interface differences in Creo vs pre Wildfire 4.0 user interface. Converting surfaces to cylinders and extrusions (Pseudo-Feature). Display options for Frozen, Wireframe, Vertices ,and Tangency Constraints. Basic workflow for generic repair vs more difficult repairs. Model over Import Geometry efficiently. Learn to utilize copy tools to simply the more complex import geometry. Learn to disconnect parent child relationships to import data. Learn to maintain some parametric ability with multiple imports. Learn to create fully modifiable Creo geometry with scan data or point cloud data. Discuss using Creo Style to reverse engineer components and make parametric and robust geometry that can be modified after analysis. Experience a serious introduction to Flexible modeling tools. Compare flexible modeling to import tools inside IDD. Equation Driven Geometries – It is understood that participants in this course have used equation, graphs on projects since taking the Level 1 WEEK ONE surfacing intensive. This portion of the class goes to a much higher level. Learn to create and use analysis features. Ductwork that drives a cross sectional area parametrically ie. 2 stroke engine / aircraft inlet. Rendering using Creo 3.0 or Creo 4.0 Mental Ray tools. Ray Tracing to generate images. Learn to get photorealistic rendering results. Learn to get textures such as Leathers and other textures. Discuss what all is left out of this powerful mental ray software in the Creo PTC user interface. Share specific work examples with your instructor. Participants can keep the username and password for the Design-Engine web hosted tutorials to recreate after the class is finished. This course is a serious advance on the Design-Engine Creo Surfacing: Week One workshop. This Creo training course is developed for specific seasoned users who previously took the Design Engine one week surfacing intensive and want to push their proficiency learning potential with Creo Surface modeling in just one week. We help you learn specific workflow techniques using Creo not read to you from an exercise. In this course, we help design engineers and industrial designers discover techniques for leveraging Creo Surfacing in ways other more experienced users may not have discovered plus practice methodologies for making changes quickly to set them up for pushing past expert status. As with all Design-Engine classes, participants keep the training material login and password for life.